I am not one for religious rituals for the simple reason that I am quite ignorant of most of them, whether it be what one is supposed to say and do in a temple, church, mosque, synagogue or gurdwara. But that has in no way diluted my love for religious places. 🙂 Yes, god is everywhere—Next to me, as well as you. But within certain sacred walls, in the culmination of art and the faith of followers, He (or to be a feminist She—God doesn’t really care; we are the ones with all the issues) is a bit more tangible. Almost visible in his invisibility. 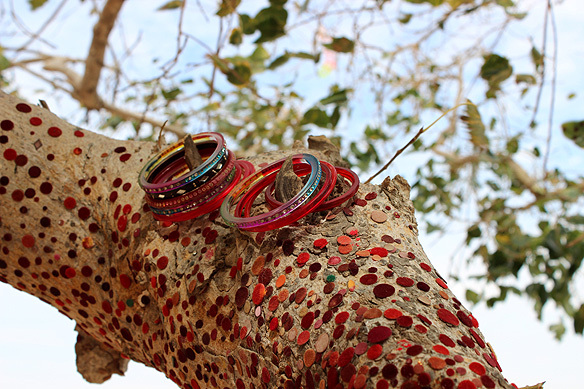 One of the most charming rituals I have seen in my travels is the bindi covered tree as I entered the Koteshwar Temple in Kutch, en route to Lakhpat (the temple is 36 kilometres from the Lakhpat fort). Big, small, tiny bindis, in all shades of red, with the odd set of glass bangles, swathe the entire tree trunk, creeping up its branches seemingly touching the skies. They are offerings by women for the love of their lives. The bindi and bangle synonymous with marriage. 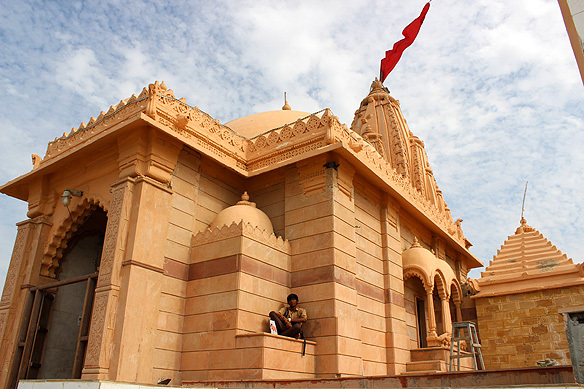 The Koteshwar Temple perched atop a hillock on the western tip of India in Lakhpat Taluka, Kutch district, Gujarat, is an ode to Shiva, one of the primary forms of god in Hinduism. The current edifice dates back to 1820 and is built on the banks of the Kori Creek, facing the Arabian Sea. Across the waters is Karachi, Pakistan. Once upon a time a port, today it is a fishing village; its main claim to fame being its temple. 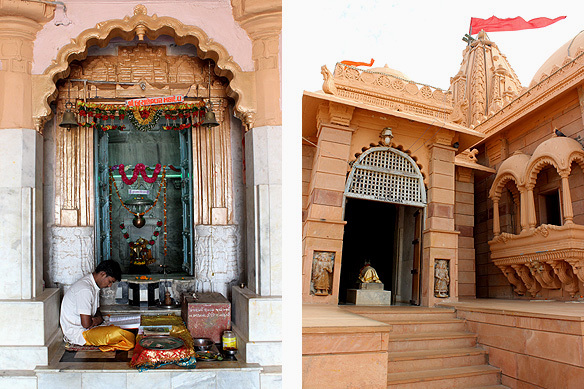 There are two legends associated with the temple, both equally fantastic, tracing back to the Ramayana. One mythological tale claims Lord Shiva rewarded Ravana for his exceptional piety with a Shiva Lingam possessing colossal religious powers. Ravana, however, dropped it in his haste and the lingam fell to earth landing at Koteshwar. 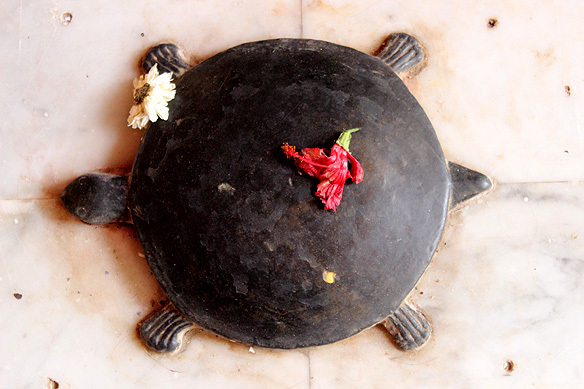 To punish Ravana for his carelessness, the lingam multiplied into thousands of identical ones. 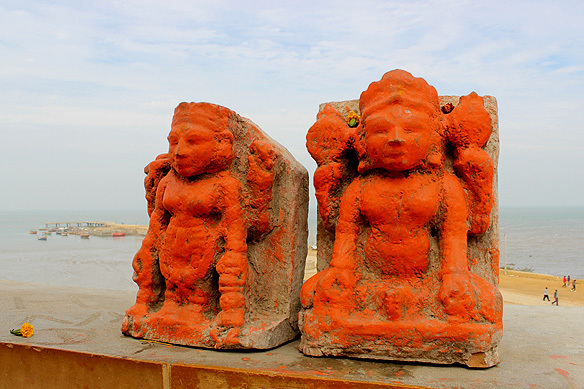 Ravana unable to distinguish between them simply grabbed one and left, leaving the original behind around which the Koteshwar Temple, also known as Kotilingeshwar Temple, was subsequently built. The second story is no less fascinating. In this, the gods fearful of Ravana becoming infinite because of the powers bestowed upon him by Shiva, unite and trick Ravana into giving the lingam to them. 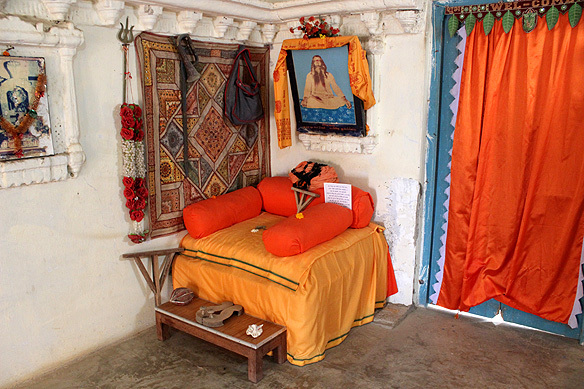 Once in their possession they install it in Koteshwar. 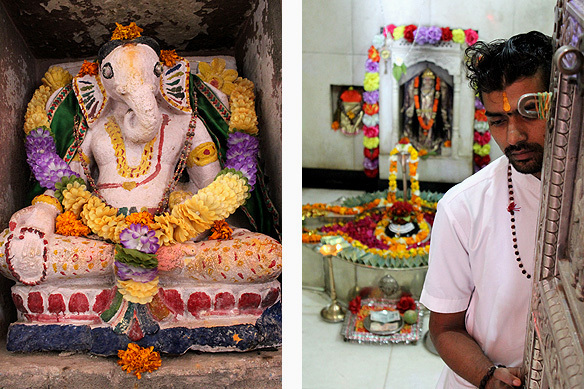 People from far and wide come to the Koteshwar Temple; some make the journey in fervent faith whilst others go about rituals punctuated with taking selfies. It does not really matter. 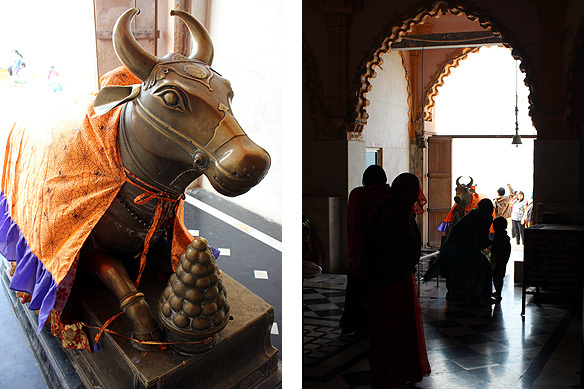 Replete with the lingam, nandi (Shiva’s mount and gatekeeper) and various other deities, there is sacredness in everything herein. 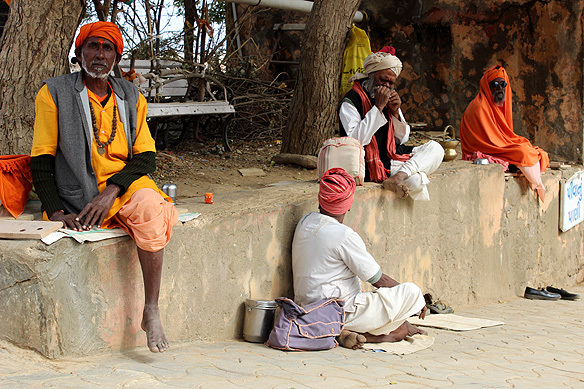 As I leave I see a quirky group of sadhus, including one with dark shades, seated outside the temple. I ask them if I can take a picture. The poses are instinctive and timeless like the temple itself. This entry was posted in Exploring India, Gujarat and tagged Gujarat, Hindu mythology, Hinduism, Koteshwar, Kotilingeshwar, Kutch, Nandi, Ramayana, Religious Rituals, Shiva, Shiva linga, Temples by Rama Arya. Bookmark the permalink. I hope you do. 🙂 It was incredibly serene and lovely in an understated way.